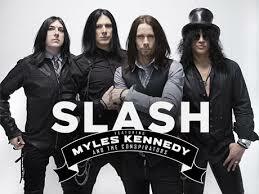 Slash Featuring Myles Kennedy & the Conspirators will return this fall with their as-yet-untitled third studio album. The group, Slash (Guitar), Myles Kennedy (Vocals), Brent Fitz (Drums), Todd Kerns (Bass & Vocals) and Frank Sidoris (Guitar & Vocals), has entered the studio with producer Michael "Elvis" Baskette (Alter Bridge, Iggy Pop, Incubus). Expect the group to announce a full North American tour for the fall. This same team worked on the group's last album, World On Fire, tagged by Guitar World as "another bold and unapologetically riffy statement" and "a varied, immersive and incredibly hard rocking effort" (December 2014). Rolling Stone described Apocalyptic Love, the band's debut album and Slash's second solo release overall, as "filled with head bangers and plenty of fancy fretwork" and Revolver declared it "a collection of lean, high-octane rock-and-roll tunes built to be blasted out of open-top sports cars, or more suitably, open-air stadiums" (May 2012). "I'm excited about the new stuff we put together for this next record; it's got some cool songs and it's got a great live feel." explains Slash. "I've been working with Myles, Brent and Todd for about 8 years now. It's been an amazing ride so far; as a band we continue to get better which is great. With the addition of Frank since the 'World On Fire' tour, I feel we have hit a great, creative stride which I definitely think shows on this next record." Slash adds, "Guns N' Roses will be headlining European festivals this summer, it's going to be a 110% performance and a huge blast. I love doing European fests and this is the first time we've done any proper festivals over there on the 'Not In This Lifetime Tour'. It's indescribable to explain these shows. I'm looking over and seeing Axl, Duff and Dizzy whom I've known forever, but it also feels like an entirely new experience with Richard, Frank and Melissa. It's like being in a new band, except there's a chemistry that is established from days of old, so it's a natural thing that's always been there."